"There is no duty we so much underrate as the duty of being happy. By being happy, we sow anonymous benefits upon the world, which remain unknown even to ourselves, or when they are disclosed, surprise nobody so much as the benefactor." Steve (My therapist): You deserve to be happy Dave. You deserve to have a high quality life. Steve: If you aren't going to do it for yourself Dave at least do it for your kids. They deserve to have at least one happy, healthy parent. They don't deserve to have to worry about you. David Markham: Yes, you're right. If I can't be happy for myself, at least I could be happy for them so they aren't so anxious about me and life. As I was driving home from my appointment with Steve I got angrier and angrier, fuming about why nobody had told me this before. I deserve to be happy? Really???? It's my job to take care of other people not to make myself happy. My needs should come last after I take care of those in my path who are in need. The way to heaven is to be a self sacrificing martyr, right? That's what I had been taught by my Roman Catholicism and by my family growing up and by my wife and our nine kids. Now with the two youngest dead and my wife so psychologically devastated as to be of no use to anyone, it was all on me and here Steve is telling me that the best thing I could do for everyone is to make myself happy and create a high quality life. It seems paradoxical, counter-intuitive, contradictory to what I have always believed. And where it our UU values does it say that we value happiness? Where does it say that I deserve to be happy and have a high quality life especially when I see so many other people suffer and such injustice and evil in the world? No where does it say that I should be happy, that I deserve to be happy, that I should pursue a high quality life. Not explicitly does it say that, but it may be hidden in there. It may be implying that if I adopt these 7 values, these 7 principles that then I will be happy. I guess I have inherent worth and dignity like everyone else and if I do then what? How should I treat myself, what do I deserve? I guess I have a right to justice, equity, and compassion in my human relations and if I really believed this and applied it to myself and my relations then what would the results be? All right, I'm getting it now. I could go down the list of principles and probably figure out how, if I applied them to my own self, to my own life, how they would make me happy and help me develop and create a high quality life. 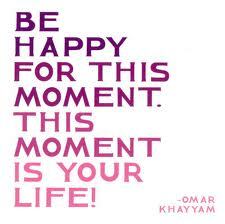 Did you, do you know this, that you deserve to be happy and have a high quality life? How did you come to understand this? I think your 'happy' in what you do from your blogging to working to create BUUF ... it shows in your dedication and caring. Will you post the song 'Don't Worry be Happy" sometime soon. Happiness is a state of mind, Dave. Some people choose it, some don't. Some blame their lack of happiness on others, or visa versa. Sometimes our situations can affect whether we FEEL happy or not. I like that saying... Ignorance is Bliss... or what I don't know won't hurt me. Why do all the insane people seem to be happy? I think happiness is sometimes like the weather in Rochester... if you wait out that miserable stuff, things will change... and you will probably feel happy again. God's is the healing, the growing, and the fulfilling. When I lose perspective and imagine everything (or most things) revolving around myself -- I make myself a little god, and lose my joy. For I was never made to be a little god --- Only to be loved by the great God. Perhaps I am trying to love other people instead of loving myself. -- When I can do that -- then I can begin to understand how great God's love is. The poem is in her book, "I hear A Seed Growing." If you'd like, I'll copy and send you the whole thing. Peace be with you, my friend.